For memory retrieval, pattern completion is a crucial process that restores memories from partial or degraded cues. Neurocognitive aging models suggest that the aged memory system is biased toward pattern completion, resulting in a behavioral preference for retrieval over encoding of memories. While there are behavioral tasks to assess the encoding side of these memory differences, pattern completion has received less attention in the literature. 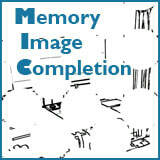 Here, we built on our previously developed behavioral recognition memory paradigm - the Memory Image Completion task (MIC) - a task to specifically target pattern completion. It provides a means to assess memory related deficits and response biases and it is easily, repeatedly and reliably testable. The task is provided as a Unity executable. The MIC and its documentation is openly available at the Open Science Framework.